Contrary to many rumors, Honda announces that their Ridgeline pick-up will remain in production for 2012. 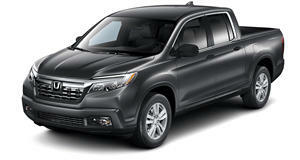 Over the past several months, there have been many rumors swirling around regarding the future of the Honda Ridgeline. Since it&apos;s never been a huge seller for the Japanese automaker since its 2005 launch, many industry watchers suspected that its end was near. In fact, sales have fallen to 6,500 units from 12,700 in the first nine months of 2010. Although it&apos;s won many awards, the Ridgeline simply failed to fully catch on. According to Sagi Marie, manager of truck product planning at Honda, "The reports in the media that we have plans to discontinue the Ridgeline pick-up truck are false." So that settles that (for now). Its power comes from a 3.5-liter V6 with 250hp and is mated to a five-speed automatic transmission. Built on a unibody architecture ladder frame/unibody hybrid chassis, it also boasts four-wheel independent suspension. Many buyers don&apos;t buy it for typical pick-up truck duties, but rather for its utility and everyday conveniences.